My daughter and I enjoyed a Devonshire tea with a difference here a couple of weeks ago. My scone was large and soft, just the way I like them. Instead of the usual plain scone though, mine was flavoured with honey and lavender. My favourite thing was the vanilla flavoured cream which I'm going to try and duplicate at home. The tea rooms is also home to the Wickedly Delicious Patisserie and it lives up to its name with some truly delicious offerings made by the owner and baker Helena. In 2008, Helena won an award for her pies - Australia's best Chunky Steak pies. From time to time they also run cooking classes too. 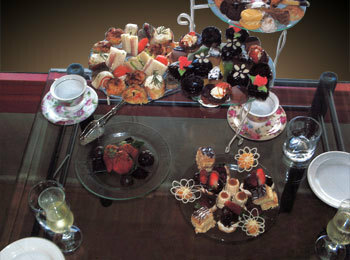 For special occasions there are High Teas on offer ($65) with a minimum of 4 people and 2 days notice, and specialty cakes to buy. Take Dad for Father's Day. My only criticism is that they need to set up a children's corner. There is plenty of room and my daughter and I would have been able to stay longer if our 20 month old & 3 year old had had something to occupy their selves with. We often do coffee and the places with chalkboards and a few toys are a godsend when you have little ones. When: Mondays, Thursday to Sunday. We will check this out next time we visit the hills! I googled Mountain Grande Tea Rooms and stumbled on your great post, thankyou! Did they have whole cakes available to purchase on display that did not require pre-ordering?